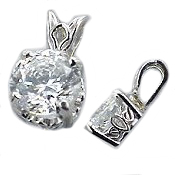 Stock #1898: 1/2, 1, 1.5, 2, or 3 Carat Russian CZ Antique/Scroll style Pendant. In your choice of 14k White or 14k Yellow Gold. These Beautiful Russian CZs are more precisely cut & polished from the finest CZ crystals. Also available with Rope Necklace. Matching earrings are item number 1924, and they make a beautiful gift set for any woman!